An exhibition of paintings and photographs inspired by the Old Men Dancing. The show will present sensually moving paintings of the Old Men Dancing by Esther Simmonds MacAdam and Esther Vincent's spacious photographs of weather patterns used in the multi-media performance of Bill James' "Weathering." Esther Simmonds MacAdam is the daughter of Old Man Dancing, Colin MacAdam. Esther Vincent works with the Old Men as a stage and production manager. When Simmonds MacAdam contacted Vincent with a request to use some photographs as source material for paintings, Vincent suggested presenting a shared exhibition in conjunction with the Old Men Dancing's performance this week at Market Hall. 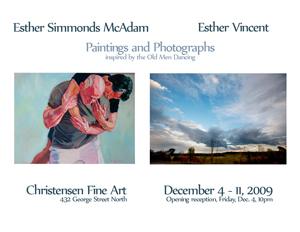 The two Esthers found a home for the show at Christensen Fine Art who will be displaying the work for the week of Dec 4th to 11th. Bio: Esther Vincent first learned about photography as a young girl curious about her father's darkroom. You can see her photographs in posters, album art and promo for a number of small independent Canadian bands. She also does archival and promotional photography for performance (theatre and dance), galleries and events. Her photographs have been published in the PRHC’s Insight’s magazine, The Peterborough Examiner, Canadian Organic Grower and Site Sound Magazine.